At the end of the Second World War, America’s newly acquired status of hegemonic power- together with the launch of ambitious international programs such as the Marshall Plan- significantly altered existing transatlantic relations. In this context, Italian and American architectural cultures developed a fragile dialogue characterized by successful exchanges and forms of collaboration but also by reciprocal wariness. The dissemination of models and ideas concerning architecture generated complex effects and frequently led to surprising misinterpretations, obstinate forms of resistance and long negotiations between the involved parties. Issues of continuity and discontinuity dominated Italian culture and society at the time since at stake was the possible balance between allegedly long-established traditions and the prospect of a radical rupture with recent history. Architectural culture often contributed to reach a compromise between very diverging attitudes. 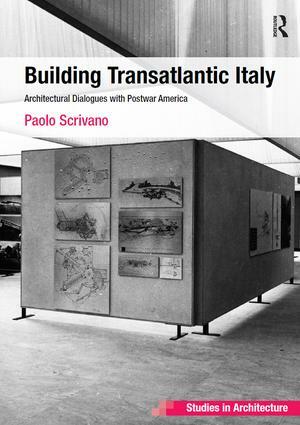 Situated in the larger realm of studies on Americanization, this book questions current interpretations of transatlantic relations in architecture. By reconsidering the means and effects of the dialogue that unfolded between the two sides of the Atlantic during the postwar years, the volume analyzes how cultural and formal models were developed in one context and then modified when transferred to a new one as well as the fortune of this cultural exchange in terms of circulation, amplification, and simplification. Paolo Scrivano is Assistant Professor of History of Modern Architecture at Boston University. His research focuses on the architecture of the twentieth century with a specific interest for the postwar years. He is the author, among others, of the volumes Storia di un’idea di architettura moderna. Henry-Russell Hitchcock e l’International Style and Olivetti Builds: Modern Architecture in Ivrea.